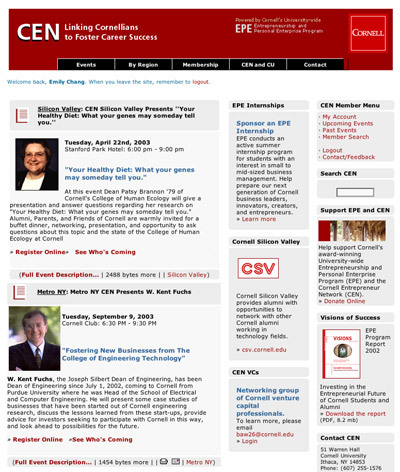 The Cornell Entrepreneur Network is Cornell University's new alumni portal. With limited funding, the site had just been built, but needed a host of new features to accommodate its growing membership, and to promote high-profile networking events around the country. eStrategy, community-building, website design, eCommerce engine, and implementation for Cornell University’s new entrepreneur portal. Consulting, interface design, application design for membership and eCommerce features, programming, content management system (CMS) customization and implementation.